Few places in the world celebrate Christmas more thoroughly or with more enthusiasm than in Norway. It is a remarkable blend of religious ritual and pagan rites. The warmth of the season celebrating light and good will is an expression of well-established customs and traditions. That might not be quite the case, but even though most Norwegians conclude with the “Day of the Three Wise Men,” thirteen days after Christmas Eve, there are some who refuse to call it quits before the 20th day after the season began. 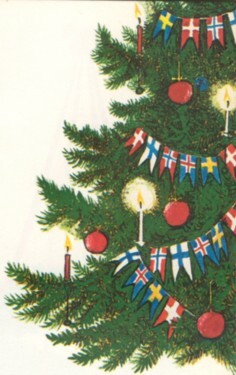 The first holiday indication is the annual reminder from the postal authorities that it is time to send packages, letters and cards to the tens of thousands of relatives manning the ships of Norway on the seven seas, not to mention a Norwegian possession such as Jan Mayen, the island between Iceland and Spitzbergen, where the mailman calls only once a year. Then in late November, plain main streets turn into julegater (yule streets), with all the proper embellishment and extra lighting, to remind everybody that Christmas is only a few weeks away. By then many a Norwegian has written a book for sale, and the bookstores are stocked to capacity with volumes, which are promptly sold. The Norwegians like to preserve their reputation as one of the world’s most avid book-reading nations. Norway is in fact the country, which annually has the greatest number of, published book titles per capita. And the pre-Christmas season is the busiest for books sold. Norwegian Christmas trees are plentiful in this country that is almost one quarter covered with forests, mostly spruce and pine. They are out for display and sale in market places and any vacant lot in sight. The biggest ones go to the University Square in Oslo, outside most public buildings everywhere, to churches, schools and hospitals. The Norwegians don’t stop there. For many years they have been sending giant trees as gifts to London, Reykjavik, the Hague, and a number of other European cities as tokens of friendship and a willingness to share the Norwegian Christmas (jul) with everybody everywhere. Even the ships of Norwegian registry feature Norwegian Christmas trees in their mast tops, wherever they may be during the holiday season. On the farm, the only one not looking forward to jul with any noticeable anticipation is the julegrisen, the pig, who by now has grown rather suspicious of all this fuss and unfailing attention paid him during the last few months. Rice porridge is more or less standard fare on the national, traditional Norwegian Christmas menu. Quite a few families serve it early in the day on Christmas Eve. For centuries in rural Norwegian Christmas this porridge has had a very special purpose. Every farm has its own little tenant, an elf called nissen, who resides in the barn and on a year-round basis keeps an eye on everything and everybody. His annual reward is a bowl of porridge on Christmas Eve. If the bowl is found empty in the morning, all is well, and the nisse has renewed his lease. If the porridge has not been touched, there is trouble ahead. So no corner is dark. And never will grow dim. The cattle, horses and other animals on the farm are taken extra good care of shortly before Christmas in order to avoid an unfavorable meeting at midnight Christmas Eve, when the animals are supposed to be able to speak and discuss the over-all impression of the farmer and his family. Even the birds are remembered. The largest and best sheaves of grain from the harvest are placed on poles out in the yard or on the roofs of the buildings. If the birds come in great numbers to enjoy this treat, the year ahead will be a good one. At four or five o’clock in the afternoon on Christmas Eve the church bells start chiming all over Norway, heralding that Christmas is here. Stores and offices close. The collection of gifts is amassed under the decorated Christmas tree in the living room. Most trees have garlands of small Norwegian flags, and in homes where there are relatives living in America, similar small American flags may be found on the tree. 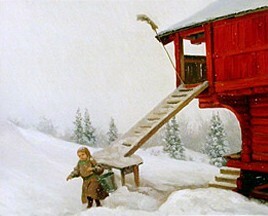 Norwegian children have no thought of the ability of julenissen – the Norwegian version of Santa Claus - to descend down the chimney. They expect that the gifts have already been delivered by him an placed under the Christmas tree. Before any gifts are handed out, the family enjoys a solid Christmas dinner, and quite a meal it is. Then follows the traditional walk around the tree with singing of all the most beloved Christmas carols, such as the one shown above left on this page. Christmas Day morning is for church going and in the evening the relatives get together. Second Day Christmas, also a holiday, means another round of festivities – gatherings of relatives and friends at home or in a restaurant or social hall.